Nihonium atoms have 113 electrons and the shell structure is 2.8.18.32.32.18.3. The ground state electronic configuration of neutral nihonium is [Rn].5f14.6d10.7s2.7p1 (a guess based upon that of thallium) and the term symbol of nihonium is 2P1/2 (a guess based upon guessed electronic structure). Nihonium: description Your user agent does not support the HTML5 Audio element. On 8 June 2016 IUPAC announced the new name nihonium (symbol Nh) for element 113 in place of the temporary systematic name ununtrium (Uut). A five-month review period expires 8 November 2016 to review this name prior to formal approval by IUPAC. Experiments resulting in the formation of element 115 were reported in February 2004 following experiments carried out between 14 July - 10 August 2003 involving scientists at Dubna (Joint Institute for Nuclear Research at the U400 cyclotron with the Dubna gas-filled recoil separator, DGFRS) in Russia in a collaboration also involving scientists at the Lawrence Livermore National Laboratory, USA. In these experiments, the primary product were four nuclei of element 115 isotopes. All these four nuclei decayed through the emisson of α-particles to isotopes of element 113. The claim has not yet been ratified, but the results are now published in a reputable peer-reviewed journal. 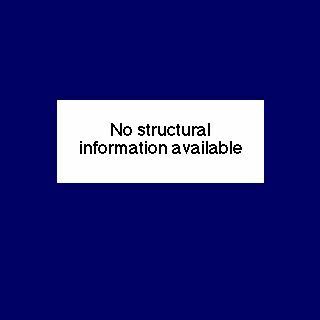 The solid state structure of nihonium is: bcc (body-centred cubic). As only a very few atoms of element 113, nihonium, have ever been made, it has no biological role. Reactions of nihonium as the element with air, water, halogens, acids, and bases where known. Binary compounds with halogens (known as halides), oxygen (known as oxides), hydrogen (known as hydrides), and other compounds of nihonium where known. Bond strengths; lattice energies of nihonium halides, hydrides, oxides (where known); and reduction potentials where known. Nihonium was discovered by (not yet confirmed) in 2003 at (not yet confirmed). Origin of name: for the element with atomic number 113 the discoverers at RIKEN Nishina Center for Accelerator-Based Science (Japan) proposed the name nihonium and the symbol Nh. Nihon is one of the two ways to say �Japan� in Japanese, and literally mean "the Land of Rising Sun". The name is proposed to make a direct connection to the nation where the element was discovered. Element 113 is the first element to have been discovered in an Asian country. While presenting this proposal, the team headed by Professor Kosuke Morita pays homage to the trailblazing work by Masataka Ogawa done in 1908 surrounding the discovery of element 43. The team also hopes that pride and faith in science will displace the lost trust of those who suffered from the 2011 Fukushima nuclear disaster. [Source IUPAC statement.]. 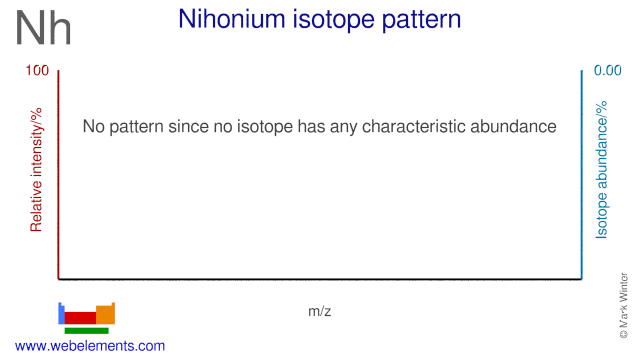 Isotope abundances of nihonium with the most intense signal set to 100%. In these first experiments, three nuclei of the 288Uup isotope were made and one of the 287Uup isotope. All the nuclei formed decayed in less than a second by emitting α-particles. These decays resulted in isotopes of nihonium, element 113, (mass number 283 or 284, containing 113 protons and either 170 or 171 neutrons). These isotopes of element 113 are also radioactive and underwent further α-decay processes to isotopes of element 111 and so on down to at least element 105 (dubnium). One of the nuclei took over a second to decay to element 111.